In 2009, I started Little Learning Lovies. Since that time, I have created hundreds and hundreds of printable resources. Some of them I create and share and think that it will be a huge hit only to see it met with a tepid reception. Other times, I have an idea that I throw together on a lark, just to see how it lays out, and suddenly I end up with a HIT! These math fact wheels are one of the latter group. I had the idea for them one evening, a few years ago, and I couldn’t go to bed until I had seen if they would work. So I created them, posted them in the store and then pretty much forgot about them. And then a reader found them, pinned them to a Pinterest board, and they have since been the top selling product at our store! Of course, I personally think the Multiplication Wheels look quite fun, and they ARE really useful. Especially for introducing or practicing facts early on. These do a great job of helping kids see the patterns within each fact set which can only help later when they are more randomized. 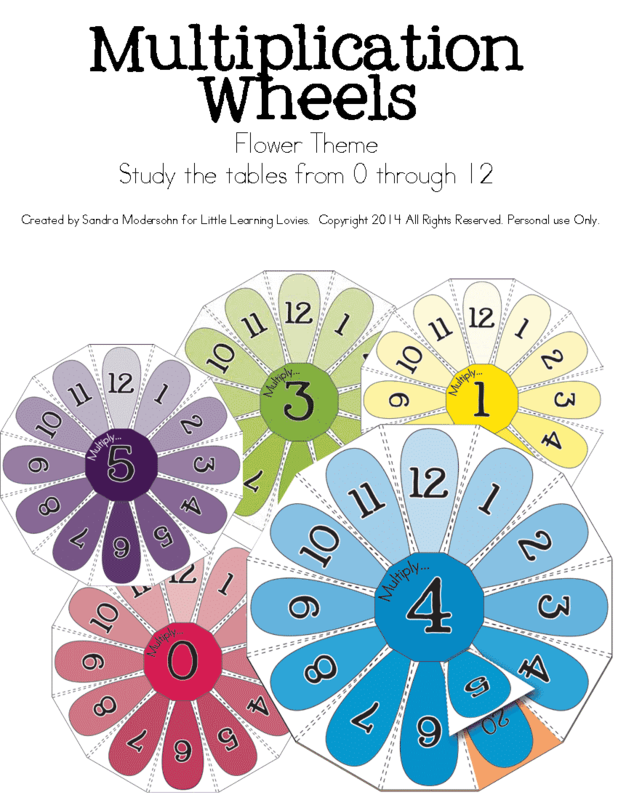 Multiplication Wheels are in our new store! Did I mention LLL started back in 2009? Yeah. Back then, the store we’re running looked GREAT. It did everything I needed it to without adding a lot of cost and it worked out well. Except: It’s not 2009 any more and now it looks and acts OLD. So we’re moving everything over to the new store, which is still right here on the LLL page! Now… Bear with me. It’s going to take a long while to officially move everything over. So for now, most of our printables can be found at the original LLL store. But we won’t be adding new things there, and we’ll be bringing some of our most popular things over to the new store here as time allows.